Dedrone's DroneTracker 2.0 offers a solution for those concerned about their privacy or public safety at large events. 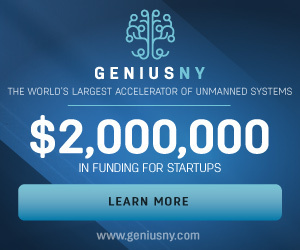 It can also help track down someone illegally operating UAS. North Dakota Sen. John Hoeven is working with the FAA and NASA to secure new opportunities for the state through it's Northern Plains UAS Test Site. His comments came as General Atomics and the University of North Dakota opened new UAS facilities. Aurora Flight Sciences is looking to expand its operational testing of the Centaur Optionally Piloted Aircraft (OPA) system to Lonesome Pine Airport in Wise County, Virginia. The White House Office of Science and Technology Policy held a UAS workshop to launch several initiatives aimed at the safe integration of UAS into the national airspace. New Mexico-based UAS manufacturer Silent Falcon UAS Technologies is expanding to Columbia, Malaysia, India, Kansas and Colorado through distribution agreements with multiple aerospace firms. The Weather Company, announced that it will work with AirMap, a provider of low-altitude airspace management services for UAS, to allow AirMap to deliver real-time weather data directly to drone operators.